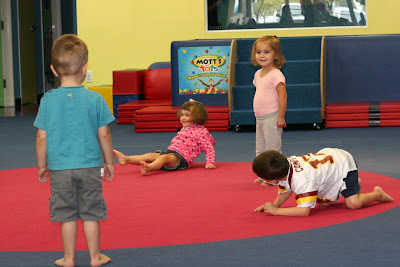 So, Eleanor (now more commonly referred to as E) started gymnastics class today at My Gym in Leesburg. 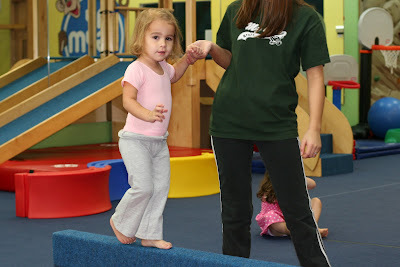 I signed her up as a way for her to get some social interaction, learn to take direction from other adults, and gain confidence in her physical abilities. (Did I just write a commercial for My Gym??) Anyway, she seemed to really enjoy it, and I was very proud of the way she listened to the teacher and followed instructions. 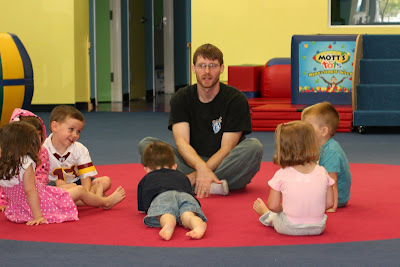 The most memorable moment of the day was definitely at circle time at the very beginning of class. Mr. Eli asked everyone to introduce themselves and say the name of their favorite book. There were five kids before E who followed directions quite nicely. When it was her turn, she very seriously said, "My name is Flounder!" Everyone chuckled. And Mr. Eli said, "Well, what is your real name?" And E said, "My name is Flounder. And my favorite book is Little Mermaid. He-he." :) Mr. Eli moved on to the next kid. Mr. Eli, who must have the patience of Job!! Doing some stretches. This is the butterfly. Of course, the ball pit is always a hit! How precious!! She is getting so big!! This daughter of yours is absolutely adorable. And the photos show that you are truly gifted. Thanks for letting me share in your life! Looks like she is loving it!! 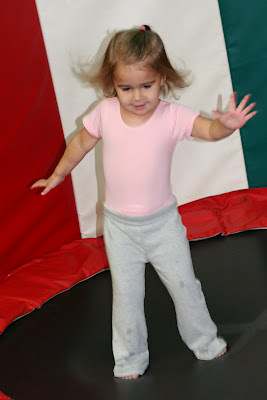 Was thinking of doing that with Emma this fall while Grace is in school?! 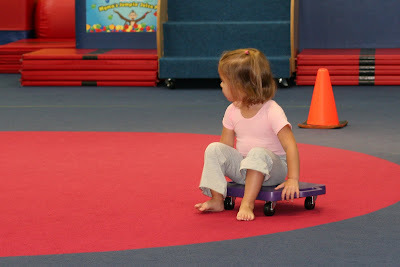 That will be really good for E. I put Shane in gymnastics when he was about 4 because he was pretty shy and needed some social time. He loved it, and it really did help him.